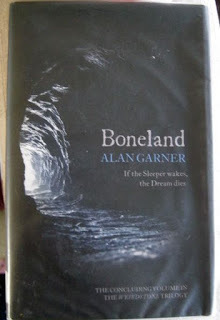 It was only after I bought it home from the library that I realised that 'Boneland' by Alan Garner was the third part of the Weirdstone Trilogy, written, in the same way that Ursula LeGuin wrote two more books long after the original Earthsea trilogy, for the same readers who are now adults. "They are back among the trees. The scarp curved in a horseshoe. The path had been rerouted, but Colin took her down along an older one, with the wall on their left and the drop to their right. They were below the pointed wedge of the hill that jutted high above the path. "It hurt to turn the stick between his palms to blow a fire heap. It hurt to follow his shoulder and to twist his head through the hill along the seam of grit. It hurt to cut the veil to set the spirits free. His hand on the blade lost its grace, and it hurt to make a beast true. Yet if he did nor make it true the spirit would not be true. Beasts would go into the world unmade. Wolves would feed until there were no more, and then wolves and all would pass because they had eaten life rough-hewn. The Stone Spirit and the Bull would see that the land was wrong and dead, and there would be no eagles sent to feed the stars; the sun would not turn from death, and there would be only wanderers and the moon and Crane flying at night. I feel like you could not come to this book cold, you need to know the back story. I read 'The Weirdstone of Brisingamen' to the children many, many years ago and it left a vague memory of the children and a necklace and some sleeping men, and a terrible fear of the narrow tunnel that the characters are forced to crawl though to escape some threat; it is not often that a book provokes such a strong reaction from me and thinking about it still makes my blood run cold. But I do not remember it well enough for this one to make much sense. 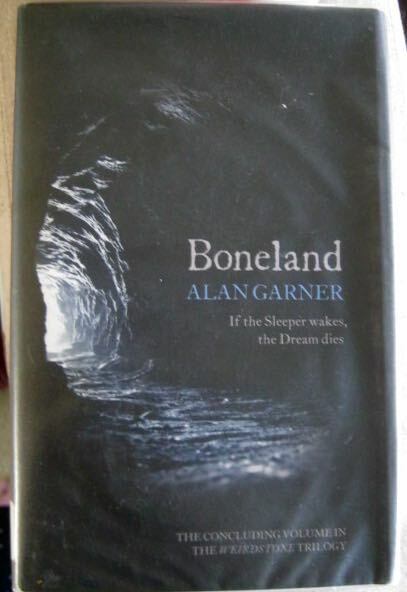 Boneland is all atmosphere, very much about the place the Alan Garner lives and writes, but it is also very much an adult book, there is no adventure or quest, there is only Colin struggling to understand what happened and if there is something left that he should do. A strange book.